This wine shows a pale yellow color. 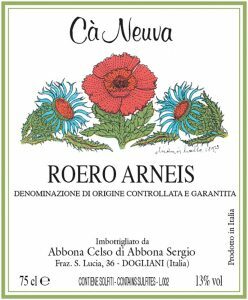 Roero Arneis is a white with a good structure but at the same time very delicate. The taste of honey and almond lingers in your mouth. It’s a very fresh and fruity wine, great in the summer during an aperitif or with fish. Method: sorting of the must kept in tanks for 12 hours at 8° C in order to obtain a natural settling. After the alcoholic fermentation constantly checked at 16/18° C, the wine undergoes further decanting.